Family Links is a national charity dedicated to creating an emotionally healthy, resilient and responsible society. Family Links produces a wealth of valuable resources, and their need to allow content to be accessible from any device with ease of use was foremost in the desired outcomes. 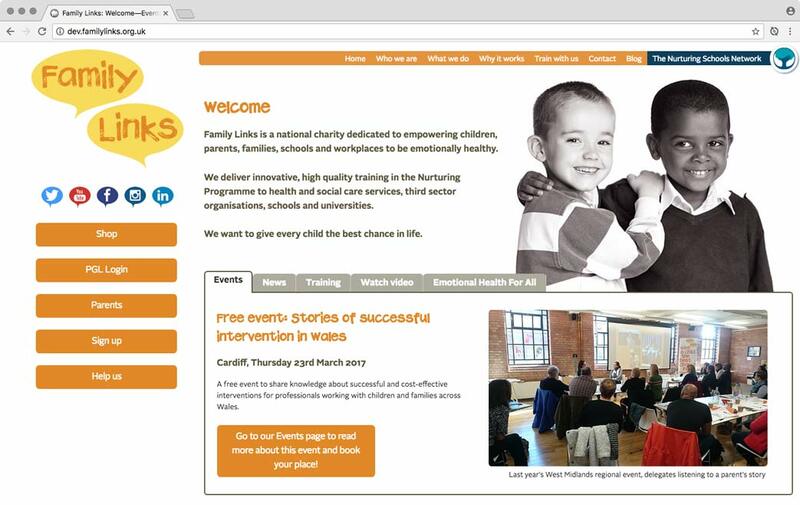 Family Links invited me to join their web team to help implement a content strategy and visual redesign which would present users with a much improved experience. Colin provides a very high level of service and takes a genuine interest in the task of supporting the promotion of our work. He spends time understanding and discussing our requirements and is extremely flexible in his approach. All the work has been delivered on time and to budget and is of a very high quality. I would recommend Colin Tester very highly. Following best practice of Responsive Web Design (RWD), careful consideration was made as to how content resources should be prepared and managed. 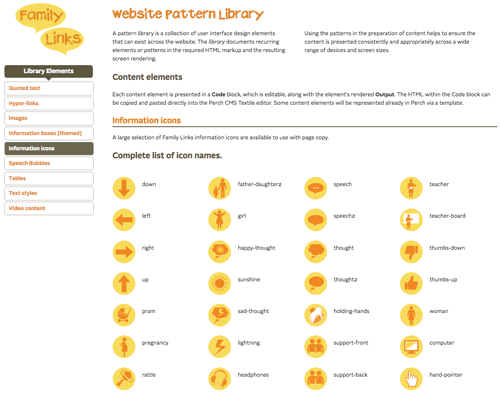 A pattern library was developed to document the repeatable and consistent methods used to present various kinds of content. The library became an invaluable resource for maintaining content accessibility; driven by compliance with web standards and the reliable display throughout the website. A wide range of invaluable resources are available from Family Links in the form of books, manuals, games, DVDs and training materials for parents, schools and trained practitioners. These resources were available via an online store, but Family Links now needed a solution that would operate on any desktop or handheld device and fulfil the desire to make transactions with payment cards more user friendly. Developing an eCommerce solution is a complex undertaking and requires a robust approach to handling user experience and security concerns. I worked with the Family Links online shop team, compiling desired outcomes into a priority list of user stories/use cases, from which development sprints were organised. Colin constructed an online shop for our charity, enabling customers to purchase our goods online and enabling us to manage the sales process smoothly. Colin worked closely with us to design the brief for the project, and during construction was able to guide us using his expertise so that the end product was fit for purpose and exceeded our expectations. As an organisation, Family Links has absolute trust in Colin and his work, and we can’t recommend him highly enough. 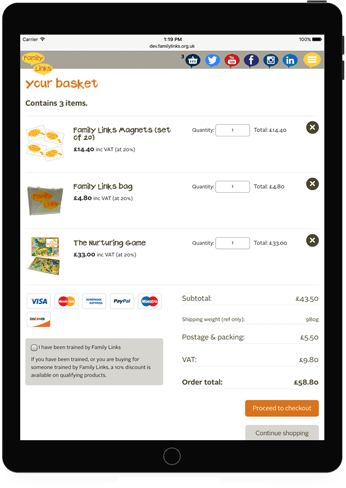 I also built Family Links a Shop Manager app to facilitate the easy management of product data and access to data for online orders. 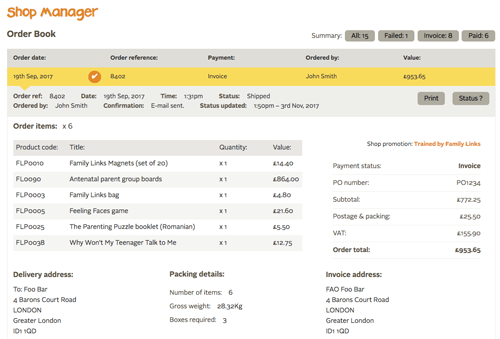 The Order Book interface would notify when new orders are received and provide access to an order’s pertinent information, including details for shipping and the payment gateway. Simple controls were also provided to allow an order’s progress status to be set, and to print out details for post order processing. Focused on the finer details whilst maintaining a comprehensive view.